You can find a perfect apartment or rental home by using the tools available at Tenants.com. You can instantly find a rental in your specific area, and landlords will compete for your business! No matter whether you are in California, Texas, or New York, you can find a great rental that matches your criteria for nearby employment, shopping centers, schools, quiet neighborhoods, entertainment centers, and more. Besides finding a rental in your area, the Tenants.com application will help you find a roommate that lives in your area and is looking for a similar rental home or apartment as you. You will be able to communicate with both the landlord and potential roommate, and the Tenants.com rental app will keep track of all your correspondence. To see what is available in your area, click the Tenants.com image below! OVER ONE MILLION rental properties available and counting! Bonus! 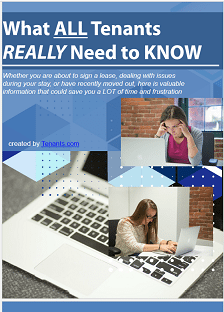 If you sign up as a member of the Tenants.com application, we’ll send you a free copy of ‘What ALL Tenants REALLY Need to KNOW’. Just click the link above to get the eBook and all of the perks of being a member of Tenants.com. It’s free! This book is FULL of valuable information for tenants, including how to make sure your lease is solid, how to deal with landlord and maintenance issues, what you should do about a noisy neighbor, pet situations, and much more! If you find an address above that you like, enter it into the Walk Score field to see all of the interesting things going on in your future neighborhood!